The insides of Surface Studio have been revealed; an expensive adventure, since the device starts at $3,000. The teardown, of course, is by iFixit – the folks famous for their excellent toolkit, as well as their teardowns that make incredible devices look very lame (but still awesome). The hardware inside Surface Studio puts us in awe yet still manages to disappoint in some regards – more on that in a moment; there are quite a few interesting things – some good, some bad, some leave us confused, while some leave us asking just… why? 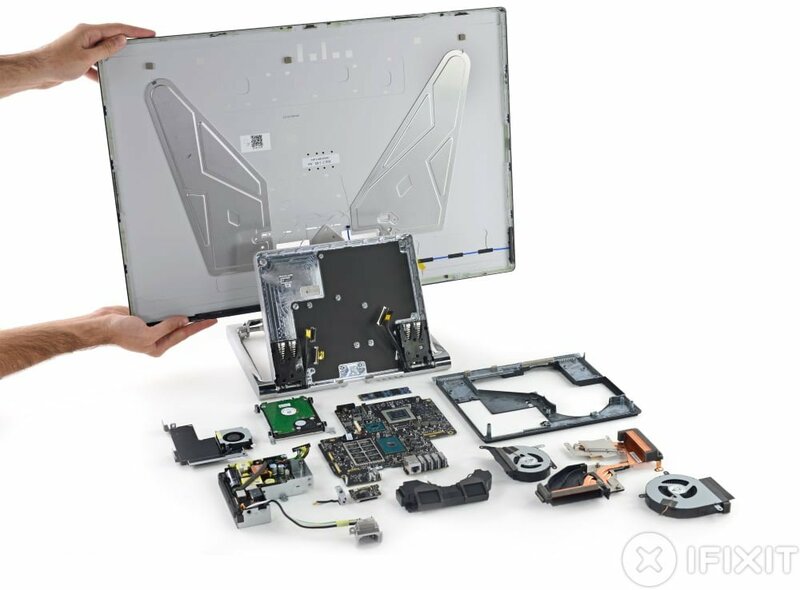 You can check out the full iFixit teardown by following this link, but here’s a summary: if you plan on opening up your brand new Surface Studio – and you might want to after you read what’s inside it – you will need a lot of tools. iFixit gave the Surface Studio a score of 5 for its reparability – describing it as average; it’s average because most of the hardware you would want to replace is within the base, which isn’t very hard to get into. Oh, and it weighs 21 lbs. Let’s just get this one out of the way: The Surface Studio has a hidden ARM processor behind its display, that – according to TheVerge – drives the incredible and massive PIxelSense display. It’s not every day we see an ARM processor hidden inside a desktop computer – but that’s where the world is going now. While the Surface Studio has a decent score of five for reparability, it is pretty bad in terms upgradability – the RAM, GPU, and CPU are all soldered to the motherboard, leaving you with no option to upgrade them. This, of course, also means that you simply won’t be able to watch Netflix in 4K on a Surface Studio – the implementation requires a 7th generation Intel processor, while the Surface Studio comes with the 6th generation one. Quite a tricky situation, Microsoft has put itself into. The All-in-One also features two storage devices – a SanDisk M.2 SATA3 SSD, and a 2.5″ Seagate SATA2 5400 RPM hard disk. Wait a minute – SATA2 hard disk? Have we time traveled to the past? Microsoft is using a SATA2 hard disk in a $3,000 desktop. That can’t be good. It is disappointing – however, it is easily replicable, so at least it’s got that going for it. It’s unclear whether replacing it with a SATA3 hard disk would give any benefits – the connector to the motherboard itself could be limited to SATA2, which would make an upgrade to SATA3 a pointless endeavor. The Surface Studio comes with an in-built SD card slot – this slot might, in fact, be replicable, as it is its own tiny modular board. The same goes for the 3.5mm jack as well. The 275W inbuilt power supply is made by Lite-On and is dual-switch, therefore supports voltages ranging from 110V to 240V – you can plug it in anywhere in the world, and it will work. The incredible hinge with custom-designed parts by Microsoft that allows the Studio to go from vertical to horizontal with a gentle touch is powered by springs – if you want to open up the display, you are going to have to go through the menace of a springy explosion. The folks at iFixit have given Surface Studio a reparability score of 5, despite the soldered CPU, GPU, RAM, and the billion other silicon chips that power this beast that are not very easy to replace. It’s the same score iFixit gave to Apple’s i5 iMac if that’s of any concern. Of course, opening the thing up would void any and all Microsoft warranties – so you probably don’t want to do that, considering the price. You can check out the full iFixit Teardown, by following this link.